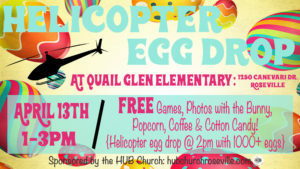 Join us April 13, 2019 from 1:00 to 3:00 pm for a Helicopter Egg Drop at Quail Glen Elementary School, 1250 Canevari Drive, Roseville. While we provide great music, there will be FREE games, photos with the Bunny, popcorn, coffee, and cotton candy! The helicopter egg drop will be at 2:00 pm with 1000+ eggs. Sponsored by the HUB Church.